On February 9, 2013, we had a weather event with high tides, snow, and street flooding. I put on my old pair of Maine Hunting Shoes and took a trip outside to assess the damage. I didn’t stay out very long because cold water seeped into my boots and my feet were quickly soaked. I went back into The Coop and posted a question on Facebook. I got a quick flurry of responses; more than 20 people responded with accurate information. Yes, L.L. 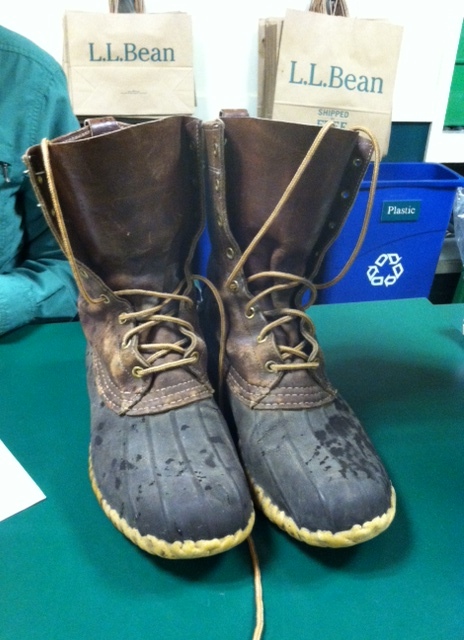 Bean would resole my Maine Hunting Shoes, also known as “Bean Boots.” There was some debate as to whether the lifetime warranty would apply. A few weeks ago, I stopped into L.L. Bean and dropped off my boots. I laughed and said, “No, I’ve had those boots since 1982; I think the sole has done its job. I was charged $39, which I paid for with one of the two L.L. Bean gift cards I got for Christmas. When finished, my boots would be shipped back to me, free of charge. After graduation, other boots took their place, but I kept my Bean Boots tucked away in my closet, just in case. Time passed and L.L. Bean became a bigger part of my life. The store grew and many of my family and friends went to work for them. L.L. Bean was one of my customers when I worked for The Big Corporation Up North. My ex-husband liked to hunt and fish and visit the store. I got a job there once, too, but I ended up moving to New Hampshire instead. Early one summer Saturday morning last year, on my mad dash for Lisbon Falls, I bought some flip-flops at L.L. Bean. Maybe I hadn’t had enough coffee that morning; when I was balancing my checkbook later in the day, I noticed I had written “L.L. Baumer” in my register. It made me laugh. My boots arrived last week with brand new soles stitched back on to the old leather uppers. New laces were included and the leather had been reconditioned, too. $39 seemed like a good deal to fix a pair of 31-year-old boots and if they last for another 31 years, they will have met their lifetime guarantee. I’ll be 80 years old. I only have one little complaint with L.L. Bean Boots today. Rumor has it the “Bootmobile” can’t make it for the Moxie Festival Parade. L.L. Baumer to L.L. Bean…we need the Bootmobile for the parade on July 13. Call Gina…please and thank you! This entry was posted in Friday Pillow Talk and tagged Alpha Gamma Rho, L.L. Bean, Maine Hunting Shoe, The Preppy Handbook, The University of Maine at Orono. Bookmark the permalink.